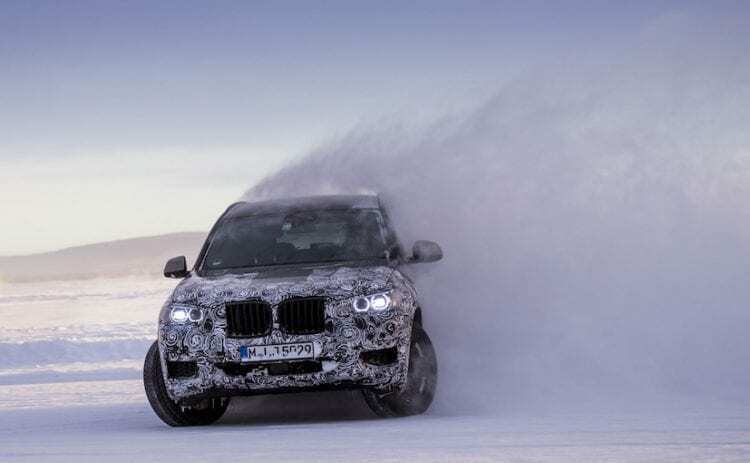 Upon finishing the cold weather Arctic testing phase, the German automaker decided to publish official spy shots that show the new 2018 BMW X3 on wintery roads. Having both official and spy shots in the same sentence is a bit confusing and contradictory, but BMW chose to do it anyway, and now these pics which were taken by the automaker reveal a camouflaged model that is a step closer to the production line. The testing took part 56 km (34.7 miles) south of the Polar Circle near the town of Arjeplog, as BMW reports. The weather over there is exactly what you would expect from Polar Circle, temperatures are extremely low, and snow stretches beyond your sight. This place was chosen because engineers at BMW think that these conditions best suit the development stage the model is in, and that is adding and adjusting both electronic and mechanical parts of the vehicle. The 2018 X3 will have BMW’s xDrive permanent AWD system. The model appears to be nearly ready for its debut and with the addition of Dynamic Stability Control and other important systems it also returns excellent driving experience, which can be said for almost any vehicle from this car maker. Great news for fans, the new X3 will have improved agility as a result of these tests. As you can see in some of these shots, drifting on ice is a possibility, but the model also features the high traction level on the ice or in any other wet terrain. Also, these photos show production headlights, taillights, and overall design serve as a confirmation for the previous ones, and we are not far from seeing the 2018 BMW X3 debut. Compared to the outgoing model, the new version is bigger and bears more resemblance to the X5 than ever before.